This is one of the paintings by Dali that is widely well-known. The genius of this painting is within the contrast between reality and surrealism. Formally the often considered "self-portrait" of Dali in the foreground against the deep black draws your attention almost immediately. Also the treatment of light on each and every subject is simply beautiful. The combination of straight edged orthagonal lines and organic lines make this composition one of a kind. Lastly the use of color in this painting is simply brilliant, I love how the bright cool blue balances all the darkness in the foreground. This painting is called the Persistence of Memory for obvious reasons. 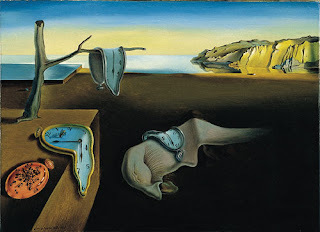 Dali makes references to how time is irrelevant in our dreams. Like I mentioned before there is a figure in the foreground which is a reoccurring theme in Dali's work, which is somewhat of a self portrait. I think you can see the in and out of consciousness within this figure considering how it is present but fading out (like dreams often do). Lastly, it has been said the orange clock in the foreground is representative of death (which can be found throughout his work).